The plush toy of a certain “little girl” (don’t call her a cat) may have been smaller than people expected, but pitcher Clayton Kershaw made up for it with his best performance of the year last night, one that looked like the Kershaw of old, before baby and big contract took a little of the polish off. Liz thought about it, and said, “OK.” And that’s exactly what he did, beating the Phillies, 5-0, and increasing the Dodgers’ lead over the Giants and D’Backs to 5 games. It was a beautiful thing. 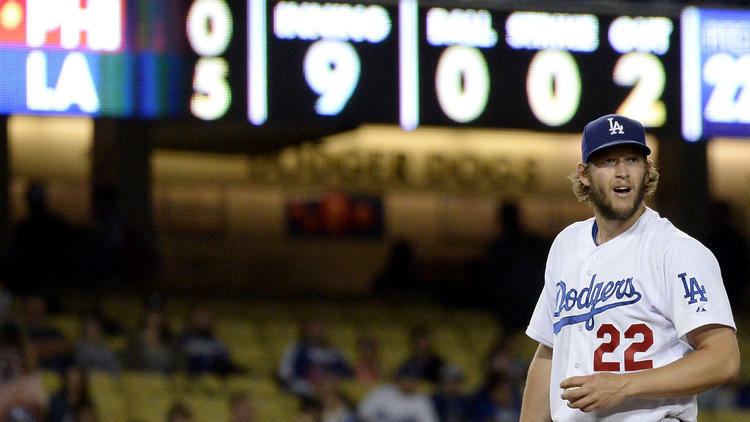 Even though he struck out 13 batters, Kershaw got in jams several times — two men on with no outs … guys on the corners with one out — but he and his favorite catcher, A.J. Ellis, got out of every one of them unscathed. And speaking of A.J. Ellis, he broke out of a hitting slump big time, going 3-for-4 with a 2-run homer in the 2nd. The gem by Kershaw was my kind of game, unlike the slogging trudgefest two nights earlier, when I was sure we were going to see the longest regulation 9-inning game in history. Monday’s 10-7 victory over Philadelphia fell 14 minutes shy of the longest National League game ever, thanks to the lack of a Dodgers starter for the evening. Why is the “best team money can buy” putting the ball in the hands of relievers who can’t even be trusted to win when they’re handed a lead? There wasn’t a single 1-2-3 inning. Nearly every batter ran the count full. San Francisco started their game after us, and were finished losing before we had an out in the top of the 6th. The 7th-innning stretch came at 10:27. Then, in the top of the 9th, with a 10-7 lead, Kenley Jansen walked the first batter and gave up a single to the second, putting the tying run at the plate. I figured he still wanted to try for the record, but he was just teasing the 50 or so fans still in the stadium, and the final out came 4 hours and 13 minutes after first pitch.